If you have a sulfa allergy, you are not likely to react to sulfites from onions and garlic and vice versa. A sulfa allergy is mediated by the immune system. Sulfite reactions occur because your body is reacting to a metabolic product of sulfite called sulfur dioxide. Although people can have sulfite reactions, it is unclear whether this is a true allergy or some other response. A specific antibody for sulfite allergy has not been identified. Sulfa drugs, or sulfonamides, are derivatives of a compound called par-amino benzoic acid. Some antibiotics contain sulfonamides; these antibiotics are commonly called sulfa antibiotics. Bactrim and Septra contain sulfamethoxazole, while erythromycin contains sulfisoxazole. Azulfadin, which is used to treat Crohn's disease, ulcerative colitis and rheumatoid arthritis, contains sulfasalazine. Dapsone is another sulfa antibiotic used for leprosy, dermatitis and some types of pneumonia. There are also other types of sulfonamide drugs that are not antibiotics. Your immune system protects you from viruses, bacteria and toxins. Food allergies occur because your body's immune system mistakenly recognizes a substance as harmful. Your immune system produces antibodies and histamine, causing symptoms such as a rash, hives, nausea, vomiting or a life-threatening reaction called anaphylaxis. Although the most common food allergies for children and adults are fish, peanuts, shellfish or tree nuts, allergies to other foods such as onions and garlic can also occur. Onions and garlic contain sulfur, which gives them their distinctive flavors. The sulfur compounds are what make your eyes sting when you chop onions, and the plants secrete them whenever their tissues are cut, bitten or crushed. The sulfur compounds in onions and garlic are called sulfites. 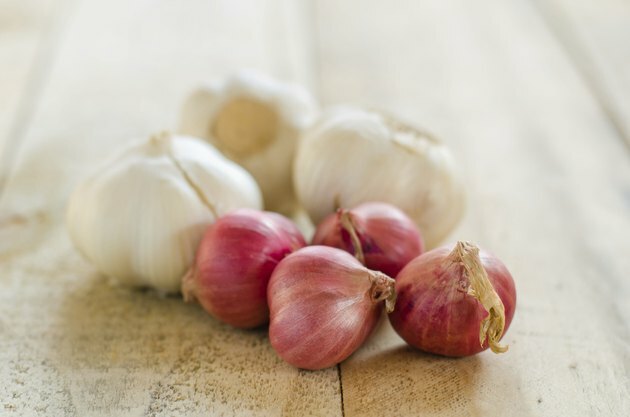 These highly irritating chemicals can kill microbes and repel insects; prolonged contact with garlic will even blister the skin, according to Dr. Eric Block, author of "Garlic and Other Alliums: The Lore and the Science." Cross-sensitivity occurs when you are allergic to something and also react to something else that is similar or in the same food family. If you are allergic to crab you may also be allergic to shrimp. If you are allergic to Bactrim or Septra you may also react to erythromycin, since all are sulfa drugs. Sulfonamides and sulfites are different chemicals and there is no cross-sensitivity between the two. Allergy symptoms can be very unpleasant and allergies have the potential to be life-threatening. If you have an allergy, you should avoid the offending substance. Always notify health-care providers of allergies to medications or foods, but you should be able to eat onions and garlic even if you have an allergy to sulfa antibiotics. If you have questions or concerns about allergies, foods or medications consult a health-care professional. University of Illinois at Chicago: Is There a Difference Between Sulfa and Sulfite Allergies?